1. Put the bay leaf and the milk in a straight-sided pan that is wide enough to fit the fillet in one layer. Bring the milk to a gentle simmer, then place the haddock fillet in the pan. Let it cook for about 5-6 minutes, or till the fish is cooked (it should be opaque). Remove the skin (it should come off easily) and gently flake the fish into a medium sized bowl, removing any small bones that you may come across. Reserve the poaching liquid. 2. Mix together the rest of the ingredients (not the oil) along with the flaked fish. Moisten the mixture with some of the poaching liquid, if required. The mixture should not be too loose, as you need to be able to form patties that hold together. 3. Put the semolina in a wide flat dish. Use both hands to pinch off a golf-ball sized piece of the fish mixture. Flatten the ball into a patty about 2-3 inches wide and 1/2 inch or so thick. Dip the patty into the semolina to coat both sides evenly and set aside on a plate. Finish up the rest of the mixture in this way. Make sure that the patties are in a single layer. 4. Put the patties in the fridge for at least an hour to firm up, preferably overnight. 5. When you are ready to cook the fishcakes, pour oil into a large frying pan so that it covers the base of the pan comfortably. When the oil is hot, place the fishcakes carefully into the pan in a single layer. 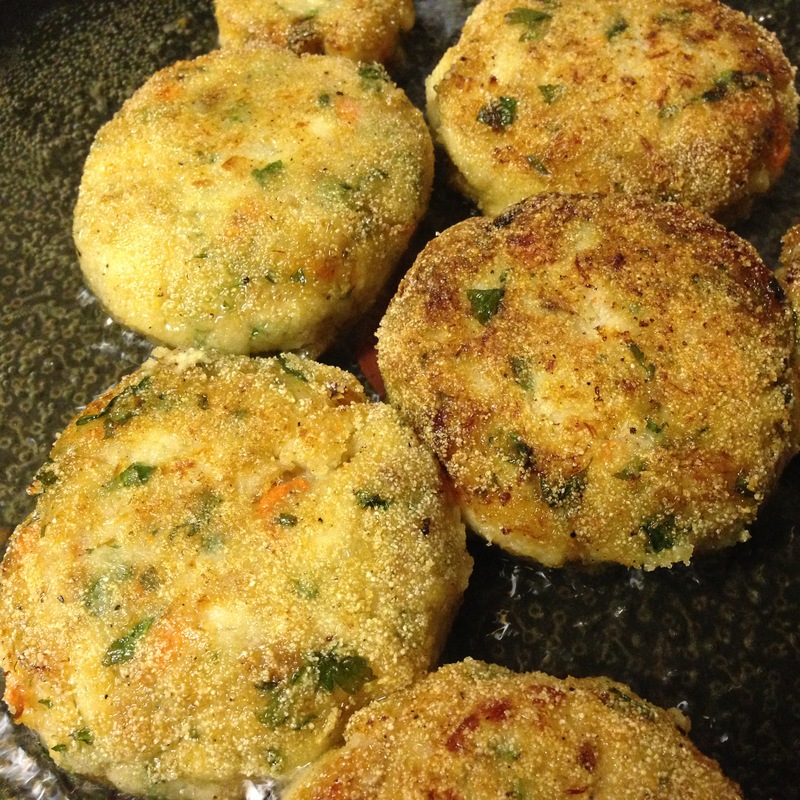 Turn the heat down to medium-high and let the fishcakes cook for about 5 minutes on one side. Then turn the fishcakes over and fry the other side until it is also golden brown. 6. Carefully remove the fishcakes onto kitchen paper to drain any excess oil. Serve immediately with aioli or sweet chilli sauce dip.